Natori Shunsen studied traditional Japanese painting at the Tokyo School of Fine Arts and after graduating from the program took an illustrator position at a Tokyo newspaper as he continued to exhibit his paintings in the city’s galleries. The prominent print publisher Watanabe Shōzaburō (1885-1962) saw Shunsen’s paintings and proposed a mutually-beneficial working relationship. Shunsen went on to create several print series over the years with Watanabe, usually in very small, luxury editions that often featured metallic pigments and deep embossing. Shunsen’s prints were marketed by subscription only, making them rare and rather expensive to collect even in the short-term. This series was issued as an actor portrait per month over the years 1925-31. 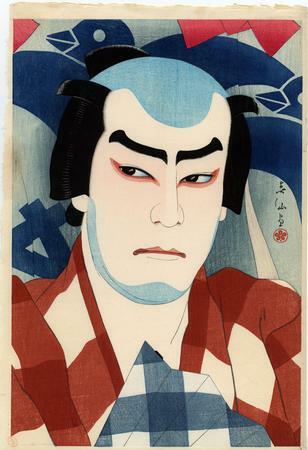 Shunsen worked primarily within the okubi-e (“large head”, bust portrait) format aiming to capture and convey the individual personality of an actor, as well as the character’s, in a kabuki role. This compelling example of Jitsukawa Enjaku II (二代目實川延若:1877-1951) playing the role of Danshichi Kurōbei (団七九郎兵衛) is widely considered a masterpiece of the genre. Collector Mike Lyon believably claims that it, ”makes my heart beat fast,” every time he sees it. Its basic color scheme is technically very complex, with numbers of blocks needed to print the varying intensities of checked patterns along with the delicately-rendered facial expression. In the nine-act play, Natsu matsuri naniwa kagami [Summer Festival, Mirror of Naniwa] performed in1926, the hero Danshichi Kurōbei is popularly felt to embody aspirations of common folk. Scholarly speculation places the scene of this complicated plot to when Kurōbei is freshly barbered and shedding his prison appearance immed landing in the new role as protector to a runaway courtesan The actor Enjaku II himself was known as graceful and charming, enjoying an extravagant lifestyle as an inveterate ladies man, and this was considered one of his best roles. "Shunsen captures the heroic essence of the handsome Danshichi Kurōbei as he swaggers out of the barbershop in a clean red-and-blue checked kimono. The characteristic curtains of the barbershop can be seen in the background. A charismatic and well-loved star, Jitsukawa Enjaku II began acting in Osaka in 1886. He first appeared on the Tokyo stage in 1899. Performances in which he co-starred with Nakamura Ganjirō I were particularly popular. Enjaku II was adept at a number of male-role acting styles, and then the hero Danshichi was one of his finest. Offstage he was a notorious womanizer." Quoted from: Stars of the Tokyo Stage, p. 92. There is a full-page, color illustration on p. 93. 1) in color in 名取春仙, 1991, p. 37. 2) in a full page color reproduction in The Japanese Print Since 1900: Old Dreams and New Visions by Lawrence Smith, p.52. There are other copies of this print in the Minami-Alps City Shunsen Museum and the Toledo Museum of Art.